Biochemistry Online Resources – Lists of Biochemistry departments, websites, journals, books and reviews, employment opportunities and events. ^ Hunter (2000), p. 75. ^ Hunter (2000), pp. 96–98. ^ Tropp (2012), p. 2. ^ Tropp (2012), pp. 19–20. ^ Fromm and Hargrove (2012), pp. 22–27. ^ Fromm and Hargrove (2012), pp. 35–51. ^ Fromm and Hargrove (2012), pp. 279–292. ^ Tropp (2012), pp. 5–9. ^ Fromm and Hargrove (2012), pp. 163–180. ^ Fromm and Hargrove (2012), pp. 183–194. Biochemistry is the study of the chemical substances and vital processes occurring in living Biochemists focus heavily on the role, function, and structure of biomolecules. The study of the chemistry behind biological processes and the synthesis of biologically active molecules are examples of biochemistry. Genetics is the study of the effect of genetic differences on organisms. Often this can be inferred by the absence of a normal component (e.g., one wild type" or normal phenotype. Genetic interactions (epistasis) can often confound simple interpretations of such "knock-out" or "knock-in" studies. Glucose is mainly metabolized by a very important ten-step pathway called glycolysis, the net result of which is to break down one molecule of glucose into two molecules of pyruvate; this also produces a net two molecules of ATP, the energy currency of cells, along with two reducing equivalents as converting NAD+ to NADH. This does not require oxygen; if no oxygen is available (or the cell cannot use oxygen), the NAD is restored by converting the pyruvate to lactate (lactic acid) (e.g., in humans) or to ethanol plus carbon dioxide (e.g., in yeast). Other monosaccharides like galactose and fructose can be converted into intermediates of the glycolytic pathway. Nucleic acids, so called because of its prevalence in cellular nuclei, is the generic name of the family of biopolymers. They are complex, high-molecular-weight biochemical macromolecules that can convey genetic information in all living cells and viruses. The monomers are called nucleotides, and each consists of three components: a nitrogenous heterocyclic base (either a purine or a pyrimidine), a pentose sugar, and a phosphate group. The most common nucleic acids are deoxyribonucleic acid (DNA) and ribonucleic acid (RNA). The phosphate group and the sugar of each nucleotide bond with each other to form the backbone of the nucleic acid, while the sequence of nitrogenous bases stores the information. The most common nitrogenous bases are adenine, cytosine, guanine, thymine, and uracil. The nitrogenous bases of each strand of a nucleic acid will form hydrogen bonds with certain other nitrogenous bases in a complementary strand of nucleic acid (similar to a zipper). Adenine binds with thymine and uracil; Thymine binds only with adenine; and cytosine and guanine can bind only with one another. A similar process is used to break down proteins. It is first hydrolyzed into its component amino acids. Free bony fish can release the ammonia into the water where it is quickly diluted. In general, mammals convert the ammonia into urea, via the urea cycle. Some proteins perform largely structural roles. For instance, movements of the proteins actin and myosin ultimately are responsible for the contraction of skeletal muscle. One property many proteins have is that they specifically bind to a certain molecule or class of molecules—they may be extremely selective in what they bind. Antibodies are an example of proteins that attach to one specific type of molecule. In fact, the enzyme-linked immunosorbent assay (ELISA), which uses antibodies, is one of the most sensitive tests modern medicine uses to detect various biomolecules. Probably the most important proteins, however, are the enzymes. These molecules recognize specific reactant molecules called substrates; they then catalyze the reaction between them. By lowering the activation energy, the enzyme speeds up that reaction by a rate of 1011 or more: a reaction that would normally take over 3,000 years to complete spontaneously might take less than a second with an enzyme. The enzyme itself is not used up in the process, and is free to catalyze the same reaction with a new set of substrates. Using various modifiers, the activity of the enzyme can be regulated, enabling control of the biochemistry of the cell as a whole. 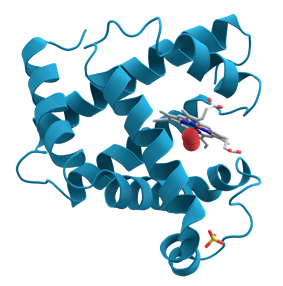 Proteins are very large molecules – macro-biopolymers – made from monomers called amino acids. An amino acid consists of a carbon atom bound to four groups. One is an amino group, —NH2, and one is a carboxylic acid group, —COOH (although these exist as —NH3+ and —COO− under physiologic conditions). The third is a simple hydrogen atom. The fourth is commonly denoted "—R" and is different for each amino acid. There are 20 standard amino acids, each containing a carboxyl group, an amino group, and a side-chain (known as an "R" group). The "R" group is what makes each amino acid different, and the properties of the side-chains greatly influence the overall three-dimensional conformation of a protein. Some amino acids have functions by themselves or in a modified form; for instance, glutamate functions as an important neurotransmitter.Amino acids can be joined via a peptide bond. In this dehydration synthesis, a water molecule is removed and the peptide bond connects the nitrogen of one amino acid's amino group to the carbon of the other's carboxylic acid group. The resulting molecule is called a dipeptide, and short stretches of amino acids (usually, fewer than thirty) are called peptides or polypeptides. Longer stretches merit the title proteins. 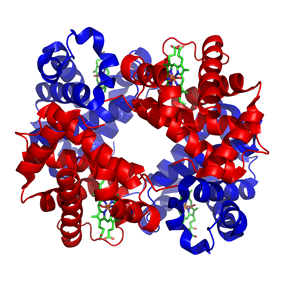 As an example, the important blood serum protein albumin contains 585 amino acid residues. Lipids comprises a diverse range of molecules and to some extent is a catchall for relatively water-insoluble or nonpolar compounds of biological origin, including waxes, fatty acids, fatty-acid derived phospholipids, sphingolipids, glycolipids, and terpenoids (e.g., retinoids and steroids). Some lipids are linear aliphatic molecules, while others have ring structures. Some are aromatic, while others are not. Some are flexible, while others are rigid. are usually made from one molecule of glycerol combined with other molecules. In triglycerides, the main group of bulk lipids, there is one molecule of glycerol and three fatty acids. Fatty acids are considered the monomer in that case, and may be saturated (no double bonds in the carbon chain) or unsaturated (one or more double bonds in the carbon chain). A triglyceride with a glycerol molecule on the left and three fatty acids coming off it. The simplest type of carbohydrate is a monosaccharide, which between other properties contains carbon, hydrogen, and oxygen, mostly in a ratio of 1:2:1 (generalized formula CnH2nOn, where n is at least 3). Glucose (C6H12O6) is one of the most important carbohydrates, others include fructose (C6H12O6), the sugar commonly associated with the sweet taste of fruits,[a] and deoxyribose (C5H10O4). Just six elements—carbon, hydrogen, nitrogen, oxygen, calcium, and phosphorus—make up almost 99% of the mass of a human body (see composition of the human body for a complete list). In addition to the six major elements that compose most of the human body, humans require smaller amounts of possibly 18 more. Around two dozen of the 92 naturally occurring bromine but land plants and animals seem to need none. All animals require sodium, but some plants do not. Plants need boron and silicon, but animals may not (or may need ultra-small amounts). Another significant historic event in biochemistry is the discovery of the Edward Tatum received the Nobel Prize for work in fungi showing that one gene produces one enzyme. In 1988, Colin Pitchfork was the first person convicted of murder with DNA evidence, which led to growth of forensic science. More recently, Andrew Z. Fire and Craig C. Mello received the 2006 Nobel Prize for discovering the role of RNA interference (RNAi), in the silencing of gene expression. (citric acid cycle). Krebs cycle and the glycolysis, such as cell of the metabolic pathways simulations. 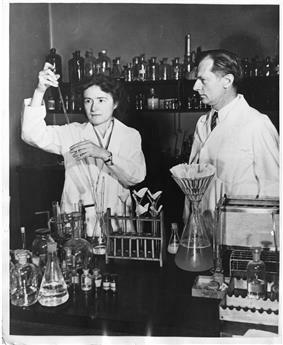 These techniques allowed for the discovery and detailed analysis of many molecules and molecular dynamics, and electron microscopy, radioisotopic labeling, NMR spectroscopy, dual polarisation interferometry, X-ray diffraction, chromatography Since then, biochemistry has advanced, especially since the mid-20th century, with the development of new techniques such as  It was once generally believed that life and its materials had some essential property or substance (often referred to as the "
The term "biochemistry" itself is derived from a combination of biology and chemistry. In 1877, Felix Hoppe-Seyler used the term (biochemie in German) as a synonym for physiological chemistry in the foreword to the first issue of Zeitschrift für Physiologische Chemie (Journal of Physiological Chemistry) where he argued for the setting up of institutes dedicated to this field of study. The German chemist Carl Neuberg however is often cited to have been coined the word in 1903, while some credited it to Franz Hofmeister. on enzymes and the dynamic nature of biochemistry.F. Gowland Hopkins and  for his work on the chemistry of proteins,Emil Fischer Many other pioneers in the field who helped to uncover the layers of complexity of biochemistry have been proclaimed founders of modern biochemistry, for example .Antoine Lavoisier or even earlier to the 18th century studies on fermentation and respiration by  However, biochemistry as a specific scientific discipline has its beginning some time in the 19th century, or a little earlier, depending on which aspect of biochemistry is being focused on. 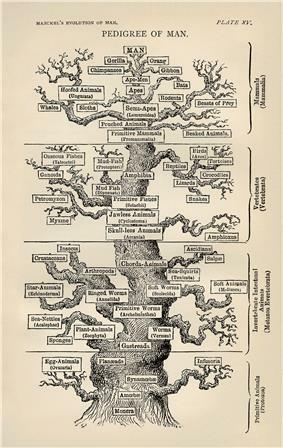 Some argued that the beginning of biochemistry may have been the discovery of the first  At its broadest definition, biochemistry can be seen as a study of the components and composition of living things and how they come together to become life, and the history of biochemistry may therefore go back as far as the ancient Greeks. Much of biochemistry deals with the structures, functions and interactions of biological amino acids which are used to synthesize proteins. The mechanisms by which cells harness energy from their environment via chemical reactions are known as metabolism. The findings of biochemistry are applied primarily in medicine, nutrition, and agriculture. In medicine, biochemists investigate the causes and cures of disease. In nutrition, they study how to maintain health and study the effects of nutritional deficiencies. In agriculture, biochemists investigate soil and fertilizers, and try to discover ways to improve crop cultivation, crop storage and pest control.